My big boy has gone to the bridge. Suzanne called me around 5:30 to tell me that the new boarder had found him down and thrashing around. She left work and called the vet, then me. When the vet got there, she couldn't even get him up to do an exam. He was in such pain and dying. There was no option but to let him go. Suzanne held the phone up to his ear and I talked to him. He tried to whicker when he heard my voice. I was talking to him as he crossed, so he knew I was there in my heart if not in person. I never ever thought I wouldn't be there for him. But he's at peace. And it was quick...no long sickness or fraility. I had seen him on Tuesday when I was in town for meetings. One of them got cancelled so I decided to run out to visit him. Thank goodness I did. The odd thing is that ever since he became mine 22 years ago, I've always said he would go at 24. His 25th birthday would have been this Saturday coming. The end of a very long love affair. God speed, my sweet sweet boy. Til we meet again. My deepest sympathies. I know your pain. I'm so sorry for your loss. "It doesn't matter where you go in life, it's the doxies you have beside you!" Paula, I am truly so sorry for your loss. I know how special Dax was. He was such a great horse, I learned a lot about horses though you and him. I know he is waiting at the bridge with the doxies that have gone ahead. 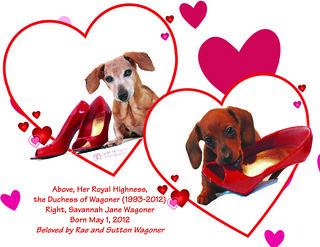 I can't imagine what a horse size hole in the heart feels like, the doxies ones are unbearable some days. Hugs, my sweet friend. Swift journey sweet boy. You are loved. I am so very sorry, Paula. I'm glad you were able to speak to him. Oh Paula - I am so sorry, and further apologize for not seeing this earlier! Life just gets in the way all too often, and here I have missed a really important (and really sad) event in your life. I am sorry for that as well. He was a good, good boy and I am so glad you happened upon a chance to go see him when you did. I know you loved him dearly, and horses are SMART. He knew, too. I am sure of it. So sad to hear about Dax. So sorry for your loss, Paula. Hope you're well!